CHICAGO — More than a dozen bald eagles have been seen in the same Chicago spot at the same time this month. Carolyn Marsh and Dave Gruver — both veteran birders and members of the IL Birders Exchanging Thoughts group — have documented as many as 14 of the majestic birds at a secluded spot near Lake Calumet. "For Chicago, it's astounding that there's a group of up to 14 at the same time that are continually there, even though that area is an industrial area," Marsh said. Gruver said he witnessed up to 10 bald eagles in 2016 and called seeing 14 this month a "euphoric high." Marsh said of the 14 spotted at one time in February, 11 were juveniles that did not have the distinct white bald eagle head. "The majority are immature eagles," she said. She said bald eagles built a nest near Lake Calumet in 2012 but no chicks hatched. There is not a nest currently, she said. "We're seeing a lot of courtship displays and acrobatic behavior," said Marsh, who noted the 14 bald eagles were spotted after an adult eagle stole a fish from a ring-billed gull with its talons. "All the immature eagles were then going after the food," she said. The bald eagle was once common in northeastern Illinois but was no longer a breeding species within the region by the early 1900s. The bird was once an endangered species but was upgraded to threatened and, in 2007, was taken off both lists. The bald eagle is still protected under the provisions of the 1940 Bald and Golden Eagle Protection Act, which prohibits anyone from harming or disturbing the birds. Illinois has become a hotbed for the bald eagle's wintering population; in 2014, the state trailed only Alaska's numbers, according to the Tribune. 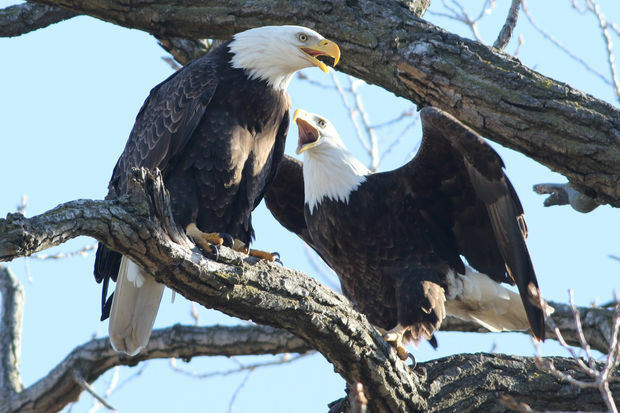 In the last few years, nesting pairs have been spotted in Lake County and a few miles outside the city in Palos Township. Bald eagles nest in the winter in warmer climates like Louisiana, but get closer to states like Illinois in the spring. A bald eagle also was photographed last March near Rainbow Beach Dunes on the South Side along Lake Michigan. One was seen in fall 2015 after being electrocuted on a power line on the Southwest Side. If you see a nest, don't get too close. As the U.S. Fish and Wildlife Service notes: "To lessen the potential for nest abandonment, please do not approach within 150 yards of the nest."